Google Custom Search plugin allows you to add a search box to your site for a custom search provided by Google and shown in your own blog. The advantage of using this plugin is that the search results will be provided by Google and their great search engine. The results are drawn from only the websites you specify when setting your search engine up at Google. You will also be able to earn money from the ads Google shows in the search results. 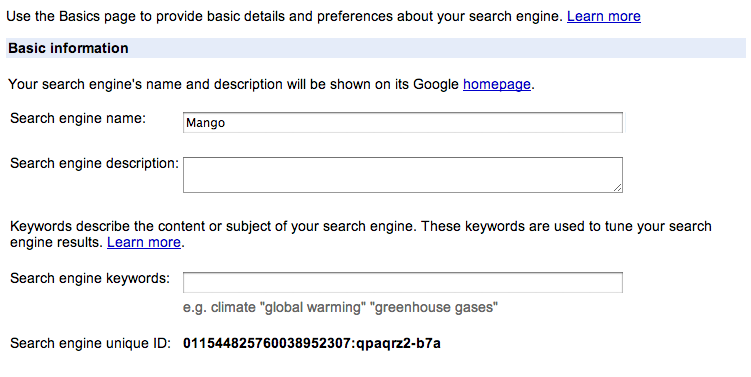 Create a custom search engine at Google, entering your blog in the list of sites to search. After doing that, you will be able to manage your engine. In the section "Next steps", click on "Change the Basics". There grab your "Search engine unique ID" and save it for later. See image below. You can also change the look and feel of your search box and search results, matching your blog's design by going to "Look and Feel"
Paste your engine id in the text input provided. That's awesome Laura! It was pretty easy to set up. Just a Note: You may want to link to this page from your blog post. It took me 10 minutes to find this page again once I lost it the first time. Yes, somehow, the post lost the link it was supposed to have at the end. I'm glad you got it working. I'll check to see if there is anything wrong with the file saving just in case. Haa anyone been able to style the search box to match their site? @Greg You can style the search form any way you need too using CSS. How would a guy style something like that? If you use firebug, and firefox, you can view the "rendered" html. This is different than the html you see when you do a view source. JS can of course effect the DOM after the page has loaded adding html that the browser understands and styles that you would not otherwise see. Please take this to the forum where people can help you. This page is not read by many people. Try http://blog.thecfguy.com/ to see problem. can you please let me know where I am doing wrong?